Reminder: All pattern booklets are used, and condition varies from near-mint to not-so-hot -- I'll try to note obvious defects, but may miss something. These publications do NOT contain my own designs. First come, first served, and all patterns sold "as is." Annie's Quick & Easy Crochet To Go #106, Aug-Sept 1997: Pin Cushion Cupie Doll, Bedroom Decor lampshade & doily, Simply Simple Afghan, Rocking Chair Booties, Country Cutie Pins, Granny's Favorite doily, Fluted Flowers afghan, New Shoes baby booties, Christmas Kitchen potholder & hot pad, Swan Wreath, Frog Hanger, Colorful Baskets, Tapestry Tote Bag, Lacy Scarf Ring, Apple Bookmark. Excellent condition. 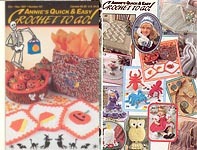 Annie's Quick & Easy Crochet To Go #107, Oct - Nov 1997. Syndee's Red Dress, Adobe Panels Afghan, Dream Catcher Jewelry, Victorian Cape for baby, Ribbon Rose Doily, Lavender outfit for air freshener doll, Halloween Kitchen Set, Diagonal Lace Afghan, Cascade Tablecloth, Creepy Crawlie crochted bugs, Crochet Candle, Scalloped Hat and Mittens, andOwl Towel Holder. Mint condition -- still has original dustcover. 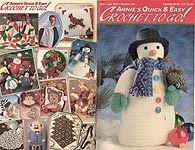 Annie's Quick & Easy Crochet To Go #108, Dec-Jan 1998: Holiday Runner, Frosty the Snowman, CottonHooded Scarf, Man Belt Holder, Poinsettia Afghan, Country Angels, Teddy Bear Afghan, Roly Poly Characters (8" tall Santa, Angel, Snowman dolls), Ribbon Belt, Christmas Wreath, White Fan Doily, Bottle Cap Ornaments (Candy Cane, Tree, Wreath), Teddy's Accessories (hat & mittens), Cardinal Pillow. Excellent condition. 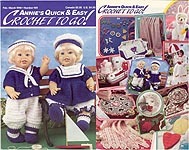 Annie's Quick & Easy Crochet To Go #109, Feb - Mar 1998, Sailor Doll Outfits, Bear Bunny Costime, Basket Business Card Cover, Spring Hat & Fan, Rose Wreath, Fashion Doll Jolly Holiday Outfit, Pretty Pink Pineapples afghan, Long-Stemmed Rose, Floral Tissue Covers, Christmas Earrings, Dishcloths / Scrubbers, Hearts Around Doily, Green and Pink Hearts Afghan. Good used condition. 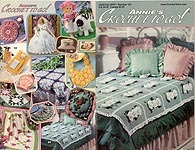 Annie's Quick & Easy Crochet To Go #110, April-May 1998 : my Rose Trellis Bookmark, plus Fancy Fan, Bunny Hot Pad, Fisherman Bear, Hide That Yardstick Cover , Bible Cover, Irish Rose Ruffled Pillow, Spring Potpourri Angel, Old Fashion Spread, Butterfly Purse, Butterfly Chenille Ornaments, Bunny Afghan. 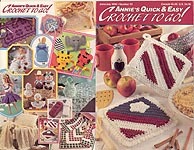 Annie's Quick & Easy Crochet To Go #111, Jun-Jul 1998: Q & E Q- Hook Rug, Happy Hangers (Elephant, Tiger, Giraffe), Luncheon Set (Doily and Edging), Ruffled Scrunchie, Milk Can Vase, Stars 'n' Stripes Pillow &Potholders, Granny Afghan, Homespun Afghan & Pillow, Angel Tissue Roll Cover (10" toilet tissue doll), Eyeglas Cases, Balloon Dolls (Farmer, Cow, Chicken, Duck), Green Diamonds Doily, Water Jar Vase, Fashion Doll Sweet Sundress. Very good condition. 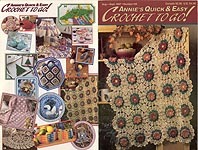 Annie's Quick & Easy Crochet To Go #112, Aug-Sept 1998: Football Afghan, Sunflower Coaster, Broom Doll Magnets, White Rose Purse, Pretty Trims, Cotton Place Mat, Rayon Doily, Apple Coasters & Basket, Apple Harvest Afghan, Jeweltone Table Banner, European Shopping Bag, Q & E Potholders, Christmas Stocking, Fireman Bar, Chenille Collar, Button Basket Pillow. Excellent condition. 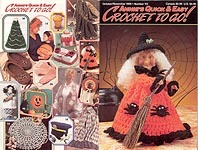 Annie's Quick & Easy Crochet To Go #113, Oct-Nov 1998: Turkey Towel Holder, Candy Bsket, Beaded Moccasins, Police Hat, Orange Headwrap, Basketball Headband, Fairy Lace Doily, Southwest Stripes Afghan, Kitchen Cutie Bag Holder, Autumn Leaves Afghan, Back Scrubber, Spider Witch air freshener doll, Christmas Tree Door Decor, Victorian Patchwork Vest, Jack o' Lantern Pillow, Marigold Tissue Cover, Poppy Tissue Cover. Excellent condition. 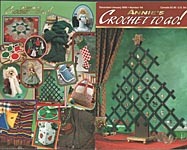 Annie's Crochet To Go #114, Dec-Jan 1999: Mini Display, Homespun Accessories Cap & Scarf, Victorian Christmas Afghan, Christmas Trees Doily, Christmas Tassels, Air Freshener Doll, Mitten Coasters, Ornamental Coasters, Scrap Bag, Holly Lion, Christmas Stocking, Christmas Potholder, Lacy Glasses Case, Poinsettia Tissue Cover, Bright Waves Afghan, Treetop Angel. Excellent condition. 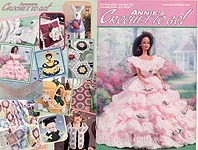 Annie's Crochet To Go #115, Feb-Mar 1999: Chenille Accents, Daisy Tissue Cover, Dolly's Christening, Handfull of Posies, Shell Purse, Pretty Potpourii, Quick Doily, Coral Rose Symphony, Heart Applique, Cooking Helpers, Love Knot Bath Set, Angel Dining Decor, Hattie Hair & Baby, Pretty ponytails. Excellent condition. 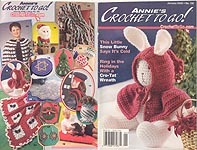 Annie's Crochet To Go #116, Apr - May 1999: Shopping Bag, Cotton Kitchen Set, Hair Bun Cover, Change of Plans Doily, Carol's Doll, Sandy's Afghan, Marvin & Mandy Mice, bath Mit, Heart Bookmark, Angel Towel Trims, Dainty Rose Angels, Double Tulip Afghan, Bright Spinner Area Rug. Excellent condition. 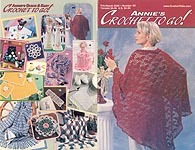 Annie's Crochet To Go #117, June - July 1999: So Simple Shawl, Texas Star Afghan, Chenille Santa Bear, Magnolia Set, Gress Glove Edging, Rose Tea Cozy, Mimi Photo Frames, Golf Afghan, strawberry Hot Pad, Patriotic Angel Pin, Tulip Doily, White Dahlia Potholder, Fashion Doll Turn-of-the-Century Bride, Betsy Ross, Cross Air Freshener, Towel Topers. Excellent condition. 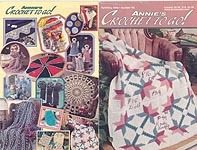 Annie's Crochet To Go #118, Aug - Sept 1999: Homespun Pillow, Keepsake Dresses, Bookmark, Basket Earrings, Christmas Stocking, Scarf & Headband, Apple Place Mat, Shopping Bag, Q & E Ripple Afghan, Floral Tissue Cover, Floral Potholder, Raspberry Skies Doily, Baby Dinosaur, Jeweled Pillow, Clothes PinDoll, Sock Trims, Cluster Afghan. Excellent condition. 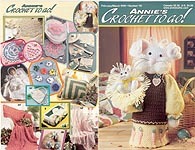 Annie's Crochet To Go #119, Oct-Nov 1999: Ripple Homespun Afghan, Grape Arbor Doily, Sweetheart Ball Gown, Monogrammed Pillow, Hanging Ghost, Snuggly Mouse Cat Bed, Jack- O- Lantern Afghan, Cat & Mouse Tissue Cover, Hacky Sack, Baker's Totes, Lacy Rose Vest, Santa Apron, Lace- Edged Booties, Eyeglass Holder. Like new. 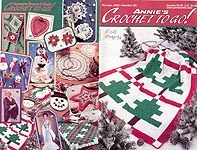 Annie's Crochet To Go #120, Dec - Jan 2000: Snowman Tree Topper, Poinsettia Earrings, Christmas Angels, Snowman Decor, Special Stitch Shawl, Doily Set, Candy Pals, Christmas Tree Afghans, Pair of Ornaments, Sequined Evening Gown, Star Hot Pad, Pineapple Card Motif, Christmas Afghan. Excellent condition. 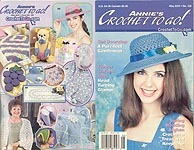 Annie's Crochet To Go #121, Feb - Mar 2000: Navy & Heather Crosses Afghan, TIssue Roll Doll, Chelsea in the Garden, Bear Hanger, Suncatcher, Pineapple Bookmark, Perfect Little Doily, Chenille Shawl, Pink Aster Afghan, Dainty Booties & Bib, Shoulder Bag & More, Country Kitchen Set, Spring Tulip Earrings, Fashion Doll Dresses. Excellent condition. 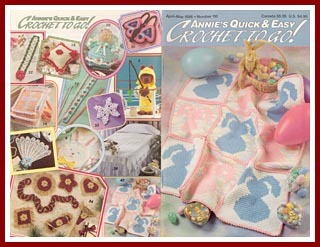 Annie's Crochet To Go #122, Apr- May 2000: Country Bath Set (Storage Container, Accessory Holder, Basket, Curtain Tie Back, Sachet), Sewing Box Doll, Pastel Medallion Afghan, Hammock, FLower Dishcloths, Fashion Doll Party Dress , Robyn's Baby Layette (Blanket, Booties, Bonnet, Sweater), Tiny Tots Graduation, Shelf Sitting Bunny, Rosebud Topper Sweater, Magnolia Pillow, Christmas Place Setting. Excellent condition. 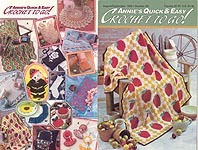 Annie's Crochet To Go #123, Jun- Jul 2000: Hearts in Heather Tablecloth, Spindles PlateDoily, Tumbling Tulip Afghan, Li'l Bo Peep Doll & Sheep (13" doll), Natural Hat, Christmas Tre Skirt, Nostalgic Flower Barrette, Gardenia Afghan, Irish Rose Pillow, Motif Baby Bib, Country Kitchen Set (Notepad Holder, Towel, Doll Dress), Seashell Pot Holder, Girl's Beaded Purse, Fashion Doll Wedding Dress. Very good condition. 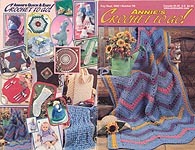 Annie's Crochet To Go #124, September 2000: my Pearl Snowflake Ornaments, plus Cotton Candy Pullover, Cross Stitch Booties, Crayon Log Cabin Afghan, Easy Kitchen Helpers, Dish Towel Topper, Hooded Scarf, Wheat Doily, Indian Clothespin Doll, Blue Strip Afghan, Fancy Pants Cover-Up, Birds on a String, One Skein Pillow, Spanish Señorita, Pink Knots Booties, Parrot Pencil Pal. 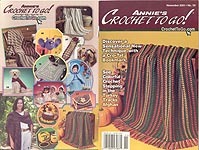 Annie's Crochet To Go #125, November 2000: Star Doilies, Scrubbies, Trick or Treat Ghost Doll, Southwest Sizzle Afghan, Shawl, Snowflake Suncatchers, Coat Hangers, Hair Scrunchies, Long Double Crochet Pillow, Autumn Time Afghan (pumpkins & leaves), Scarf & Hat, Girl Broom, Puffy Slipper Socks, Holy Jar Top, Bandit the Raccoon, Checked Doggy Weskit. Like new, except that I pulled out top binding staple when I removed the dust cover! 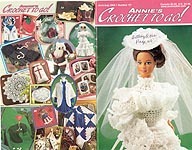 Annie's Crochet To Go #126, January 2001: Fashion Doll Holiday Fashion, Easy Pullover Sweater, Holly Bellpull, Christmas Stockings, Country Angel, Angel Garland, Deleware Diamonds, Christmas Doily, Smiling Snowman, Reversible Ski Caps, Terry Bath Set, Slipper Socks, Spider Mum Pot Holder, Mama's Angel doll, Victorian Ornament. Excellent condition. Annie's Crochet To Go #127, March 2001: my Sunshine Snowflakes, plus FramedFlowers, Scrubby Pad, Magnet Menagerie (Bear, Pig, Duck, Kitten, Pupy, Mouse), 13" Irish Lassie, Elegant Bath Set (Washcloth Edging, Scrubber, Soap Holder), Fancy Hat, Tulip Afghan, Mini Bed Doll (fits 3-1/2" stuffed bear), Flower Power Pillows, Rings of Clover Afghan, Cozy Slippers, Drawstring Purse. 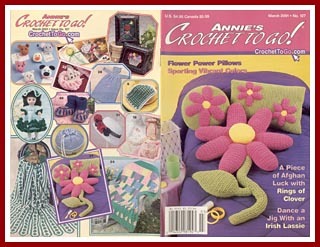 Annie's Crochet To Go #128, May 2001: Spring Wedding Afghan, Shoulder Wrap, Grapes Hot Pad, Flower Doily, House Slippers, Easter Cross Afghan, Hair Kerchief, Flower Garden Hats, Face cloth, Spring Tissue Cover, Spring Fever Afghan, Wedding Bell, Cat Doorstop, Spider Web Runner. Excellent condition -- except that I pulled out the top staple removing the dust cover again! 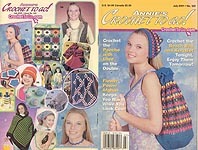 Annie's Crochet To Go #129, July 2001: Poncho with Lace, Patriotic Stars Coasters, Yankee Doodle Dandy Afghan, Hacky Sacks, Flower Power Afghan, Confetti Bag, Triangle Head Scarf, Barefoot Sandals & Blue Choker, Riversible Vest and Pecan Necklace, Beverage Tote, Beach Bag & Kerchief, Leopard Socks & Headband, Cool Hat, 15" 60's Girl & Boy dolls. Excellent condition. 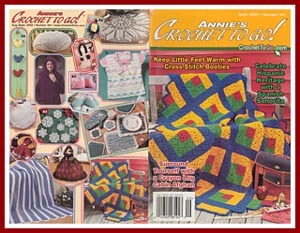 Annie's Crochet To Go #130, Sept. 2001. 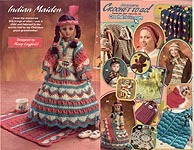 Indian Maiden, designed by Mary Layfield, . 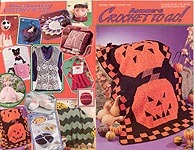 Other patterns in this issue include Dog Sweater, Broomstick Hat and Scarf, Mile-A-Minute Ripple Afghan, Poncho and Hat for toddlers, Tabasco Sauce Cover, Dancing Dollies Doily, Headband, Sand and Sage Afghan, Bundle of Joy Bib and Booties for Baby, Lady's Bag tote, Child's Play Afghan, and Puppy Mencil Pal. Excellent condition, but may smell very slightly of cigarette smoke. 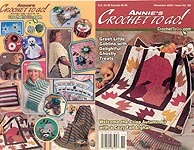 Annie's Crochet To Go #131, November 2001: Rustic Ridges Afghan (crochet on the double), Autumn Cape, Count Batty, Painted Desert Afghan, Angel Doily, Playclothes (5 outfits for 4-1/2" fashion doll), Turkey Tracks Afghan, Lady's Billfold, Cro-Tat Bookmark, Turkey Hook, Puppy Poncho, Blue Skies 13" doll, Trick- or- Treat Coasters, Sunflower Cup & Saucer. Excellent condition. 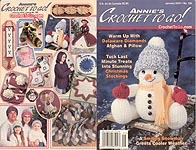 Annie's Crochet To Go #132, January 2002: Snowbunny, Lightbulb Ornament, Santa, Holland Hat & Scarf, Floor Pillow, Catnip Ornaments, Dainty Earrings, Holly Berry Afghan - Stocking - Tree Skirt Set, Bowl Cover & Doily, Cro- Tat Wreath, Shell Cape (Crochet on the Double), DStar of David Coaster, Country Christmas Afghan, Twelve Point Doily. Excellent condition.